Rockin’On on February 2019. 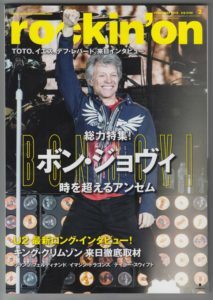 BON JOVI’s first cover of the magazine and a feature featured. An interview with JON ‘s 1994 and recent years, a history by MASA ITO, a discography explaining all the studio albums, a live report of Tokyo Dome performance on November 26, 2018, a special feature of 44 pages.